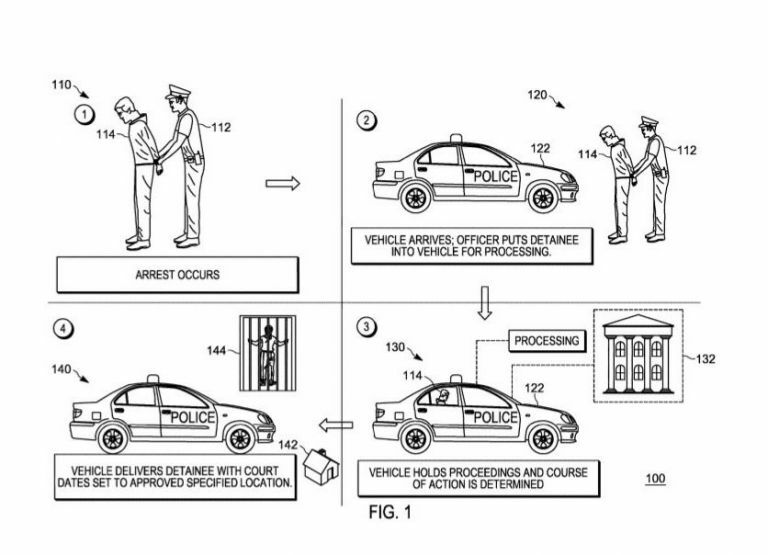 In Patent 10049419, "Mobile law enforcement communication system and method," Motorola engineers describe "A communication system, comprising: a self-driving vehicle within which to detain a detainee by a law enforcement officer" that locks you up, administers a breathalyzer, reads you your rights, figures out who your counsel of record is, conferences you in with your lawyer, consults with a court on your bail, and lets you swipe your cards to bail out of the car. 12. one or more displays, wherein at least one of the displays provides a real-time display interface to the public defender. 14. an automated payment processing device located within the self-driving vehicle for payment of fines or bail. 16. in response to a verbal request from the detainee to the virtual assistant, the communication system automatically contacts a bail bond company.